From Quarters to Krugerrands and Sovereigns to Dimes, most of the value in your coin collection comes from its precious-metal content. With today’s record-high prices, many common coins with precious-metal content can be worth up to 30 times their face value! 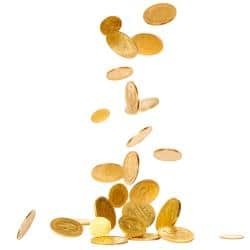 Gold coins are among the most sought-after of all coins, and Canada Gold is pleased to offer the top market price for them, including Gold Eagles, Maple Leafs, Krugerrands, Sovereigns and many more. Make sure to do your research before parting ways with these valuable items. Visit Canada Gold, the country’s highest-paying and most-trusted precious-metals dealer before you sell your gold coins.